Summary: Learn core cloud architecture concepts for Microsoft identity, security, networking, and hybrid. Review prescriptive recommendations for protecting files, identities, and devices when using Microsoft's cloud. 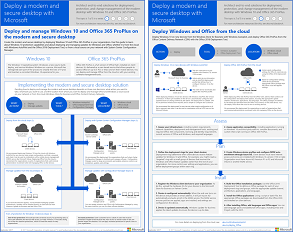 Learn how to deploy a modern and secure desktop with Windows 10 and Office ProPlus. 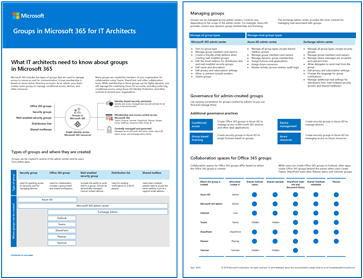 These architecture tools and posters give you information about Microsoft cloud services, including Office 365, Windows 10, Azure Active Directory, Microsoft Intune, Microsoft Dynamics 365, and hybrid on-premises and cloud solutions. IT decision makers and architects can use these resources to determine the ideal solutions for their workloads and to make decisions about core infrastructure components such as identity and security. Let us know what you think! Send us email at cloudadopt@microsoft.com. 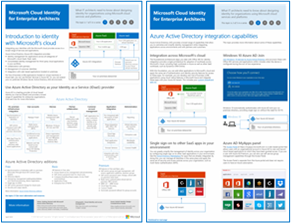 These cloud architecture posters give you information about Microsoft cloud services, including Office 365, Azure Active Directory, Microsoft Intune, Microsoft Dynamics CRM Online, and hybrid on-premises and cloud solutions. IT decision makers and architects can use these resources to determine the ideal solutions for their workloads and to make decisions about core infrastructure components such as identity and security. What IT architects need to know about designing identity for organizations using Microsoft cloud services and platforms. What IT architects need to know about security in Microsoft cloud services and platforms. 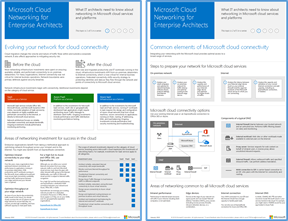 What IT architects need to know about networking for Microsoft cloud services and platforms. Evolving your network for cloud connectivity Cloud migration changes the volume and nature of traffic flows within and outside a corporate network. It also affects approaches to mitigating security risk. ExpressRoute for Microsoft cloud connectivity ExpressRoute provides a private, dedicated, high-throughput network connection to Microsoft's cloud. Designing networking for Azure IaaS Step through the design process to create an optimal Azure virtual network (VNet) for hosting server-based IT workloads, including subnets, address spaces, routing, DNS, load balancing, and connectivity to your on-premises network, other VNets, and the Internet. What IT architects need to know about hybrid cloud for Microsoft services and platforms. Hybrid cloud overview Microsoft's cloud offerings (SaaS, Azure PaaS, and Azure IaaS) and their common elements. Architecture of Microsoft hybrid cloud scenarios An architectural diagram of hybrid cloud for Microsoft's cloud offerings, showing the common layers of on-premises infrastructure, networking, and identity. 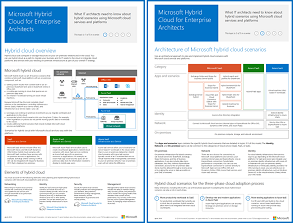 Hybrid cloud scenarios for Microsoft SaaS (Office 365) The SaaS hybrid scenario architecture and descriptions of key hybrid configurations for Skype for Business, SharePoint Server, and Exchange Server. Hybrid cloud scenarios for Azure PaaS The Azure PaaS hybrid scenario architecture, the description of an Azure PaaS hybrid application with an example, and the description of SQL Server 2016 Stretch Database. Learn about the most common cyber attacks and how Microsoft can help your organization at every stage of an attack. 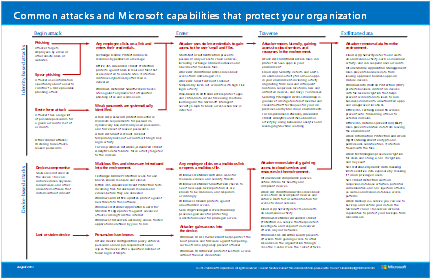 This poster illustrates the path of common attacks and describes which capabilities help stop attackers at each stage of an attack. The Microsoft 365 enterprise solution series provides guidance for implementing Microsoft 365 capabilities, especially where capabilities cross technologies. The logical architecture of productivity services in Microsoft 365, leading with Microsoft Teams. 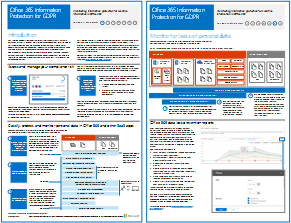 PDF | Visio Microsoft provides a suite of productivity services that work together to provide collaboration experiences with data governance, security, and compliance capabilities. 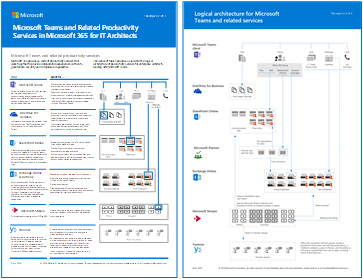 This series of illustrations provides a view into the logical architecture of productivity services for enterprise architects, leading with Microsoft Teams. PDF | Visio These illustrations detail the different types of groups, how these are created and managed, and a few governance recommendations. Recommended capabilities for protecting identities and devices that access Office 365, other SaaS services, and on-premises applications published with Azure AD Application Proxy. It's important to use consistent levels of protection across your data, identities, and devices. 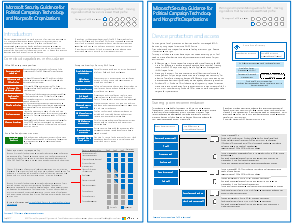 This document shows you which capabilities are comparable with more information on capabilities to protect identities and devices. 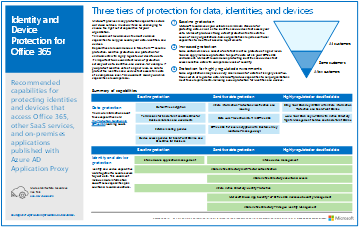 Recommended capabilities for protecting files in Office 365 based on three different sensitivity levels. Prescriptive recommendations for discovering, classifying, protecting, and monitoring personal data. This solution uses General Data Protection Regulation (GDPR) as an example, but you can apply the same process to achieve compliance with many other regulations. 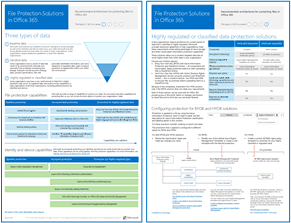 PDF | Visio To see this content in article format, see Office 365 Information Protection for GDPR. 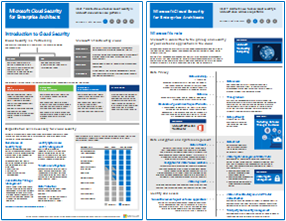 This guidance describes how to implement a secure cloud environment. The solution guidance can be used by any organization. It includes extra help for agile organizations with BYOD access and guest accounts. You can use this guidance as a starting-point for designing your own environment. This guidance uses a political campaign organization as an example. Use this guidance as a starting point for any environment. This guide is slightly revised for nonprofit organizations. For example, it references Office 365 Nonprofit plans. The technical guidance is the same as the political campaign solution guide. This guidance includes Test Lab Guides. 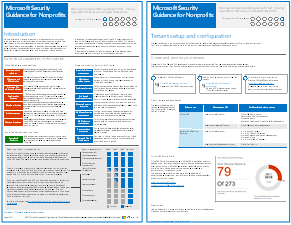 For more information, see Microsoft Security Guidance for Political Campaigns, Nonprofits, and Other Agile Organizations. Microsoft supports several options as you begin your journey to Teams in the Microsoft cloud. 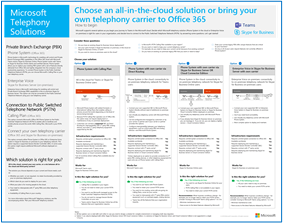 This poster helps you decide which Microsoft telephony solution (Phone System in the cloud or Enterprise Voice on-premises) is right for users in your organization, and how your organization can connect to the Public Switched Telephone Network (PSTN). For more information, see the article for this poster: Microsoft Telephony Solutions. What IT architects need to know about deploying and managing updates for Office 365 ProPlus on Windows 10.